Here is your chance to be one of the very first to sponsor a kennel at Saving Paws! What better way to honor the memory of a special dog or special person than to sponsor a kennel and provide support for an SPR dog! It is their “safe haven” until they find that perfect forever home. When you sponsor a kennel, you support the work we do at SPR, and your donation supports the dog/dogs that live in the kennel throughout the year. Whether we have 1 or 2 dogs in the kennel during the year or many dogs, your donation helps provide each dog with all the things necessary to support that dog’s care with SPR – food, bedding, toys, treats, grooming and veterinary care. You will be sent a special thank you with a photo of your plaque and a story about the dog that currently is in your sponsored kennel. For your personalized plaque, you can pick between a GSD or Belgian Malinois image. 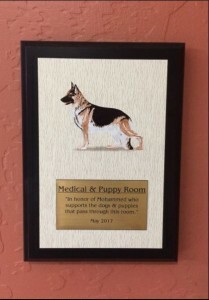 Your plaque will be mounted outside your selected kennel. Plaques can be personalized with 3 lines of information – such as your name, or of a beloved family member, special friend, cherished pet or totally anonymous. At the end of your sponsorship year you will have a choice to renew your sponsorship for another year, have the plaque mailed to you, or have it displayed with us. 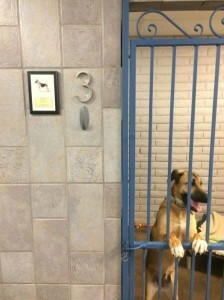 The annual sponsorship works out to less than $2.75 per day for an indoor kennel! Your donation is 100% tax deductible. Sponsorship is available to individuals, families or businesses. Donations will directly benefit the dogs and will not be used for administrative expenses. If you have any questions or wish to speak with a SPR volunteer about this program, please contact us at savingpawsrescue@gmail.com or 480-737-6089. Your kennel sponsorship allows us to help more dogs. YOU enable us to do what we do!